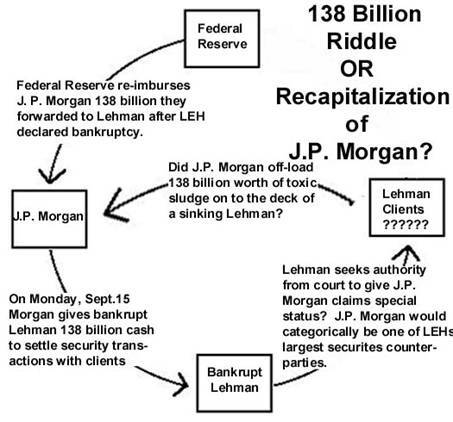 Did JPM Cash Call Bring Down Lehman ? This continues to become ever more interesting . . .
“Lehman Brothers Holdings Inc.’s main lender and clearing agent, JPMorgan Chase & Co., caused the liquidity crisis that led to Lehman’s collapse, creditors said. JPMorgan had more than $17 billion of Lehman’s cash and securities three days before the investment bank filed the biggest bankruptcy in history on Sept. 15, the creditors committee said in a filing Oct. 2 in bankruptcy court in Manhattan. Denying Lehman access to the assets on Sept. 12, the bank “froze” Lehman’s account, the creditors claimed. JPMorgan, the biggest U.S. bank by deposits, financed Lehman’s brokerage operations with daily advances, while money market funds and other short-term lenders provided overnight loans, according to bankruptcy court documents. When JPMorgan shut Lehman off from funds, Lehman “suffered an immediate liquidity crisis that could have been averted by any number of events, none of which transpired,” according to the filing. Stay tuned — this charge may have legs . . .
February 1, 2012 Found: MFGlobal Monies!